There really isn’t a time or stage that my boys have gone through that I haven’t liked or enjoyed. Whether its been the itty bitty stage with frequent wakings and feedings but special little snuggles, to the first smiles, to first steps, to the active and talkative life of a pre schooler. However Caedmon has recently entered a really fun stage. His vocabulary is growing daily and it is so much fun to watch his little brain work. He and Clint had been out running errands the other day and had stopped at the pet store on the way home. I asked him if he saw anything at the pet store and he told me “BIG arf arf” meaning that he had seen a big dog. 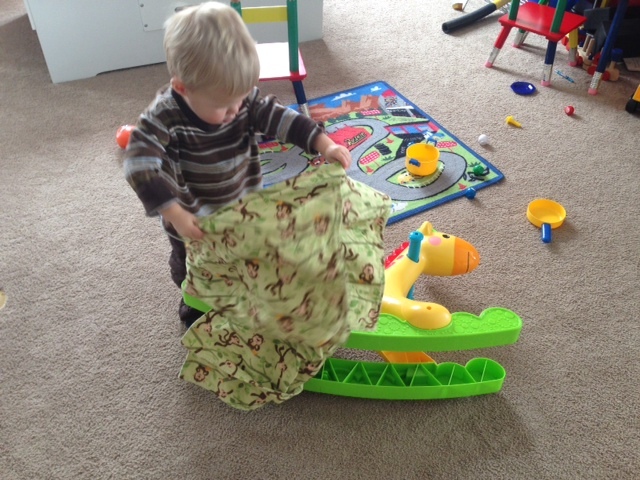 This afternoon we were playing and I love how at this stage he imitates things that he sees. 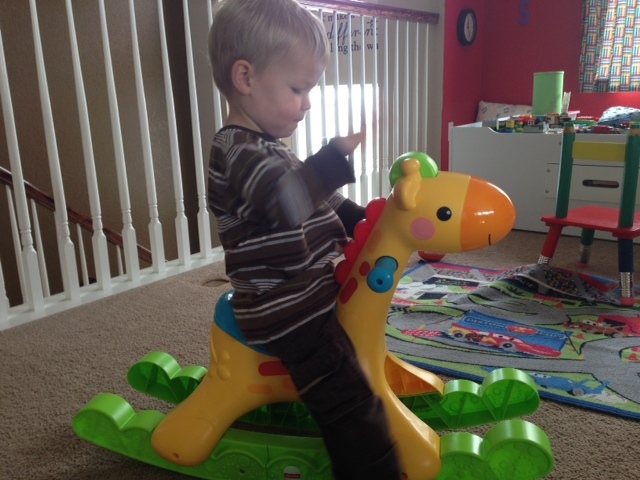 He was playing with his giraffe riding toy and then decided that the giraffe might be hungry. He promptly fed the giraffe. A short while later he then decided that the giraffe was tired and needed to go “night night”. In order to go “night night” he of course needed a blanket and babies to sleep with. 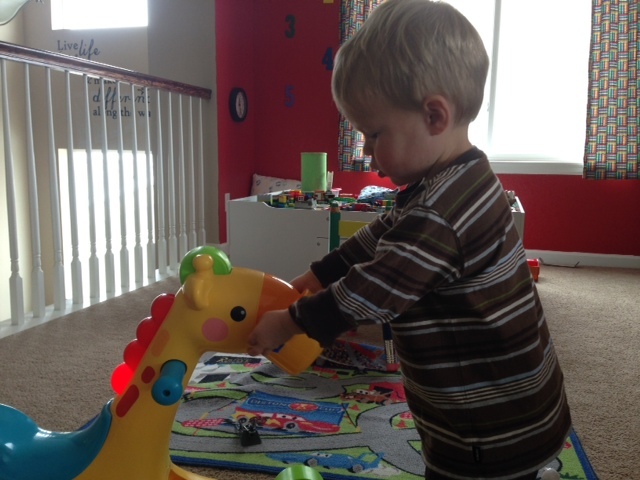 A short time later, Caedmon “read” a book to the giraffe. 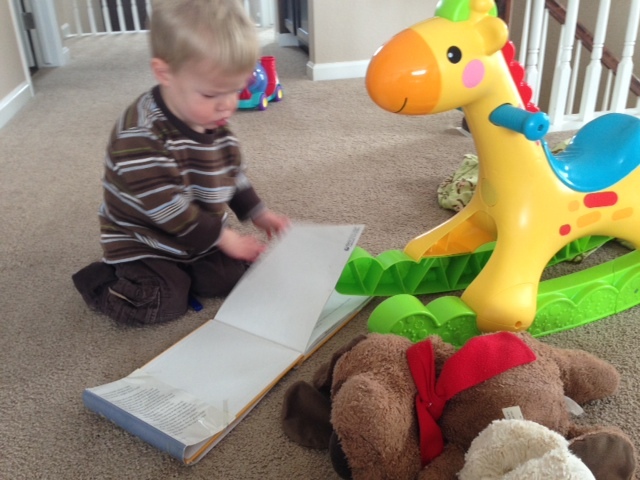 His reading mostly consisted of grabbing a book and flipping through it quickly and then tossing it aside. Hopefully that was enough reading for giraffe. I love being a mom and its fun to watch them grow into little people. It’s a daily reminder of how much they watch and learn and catch on to what we do each day, I pray that I am a good example for them despite my many failings.